It's only 3 days until Halloween and everything is set for trick-or-treaters around the house. Today I am sharing a frame that I picked up at my local craft store and painted and stamped. Of course the best part is the pretty ribbons that I used from the Really Reasonable Ribbon store. I wanted to do this really simple and easy so I just sanded and painted the unfinished frame in orange and then used black ink to stamp the cobwebs all over it. 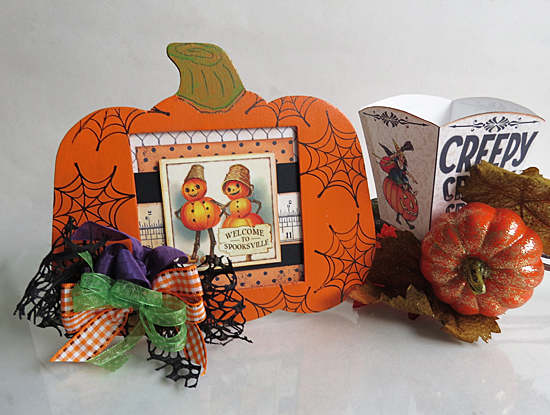 I am hoping to get a good photo this Halloween to put into it, but meanwhile I made this cute little photo collage with some papers and tags that I had from Crafty Secrets. It went super cute with the ribbons that I used. 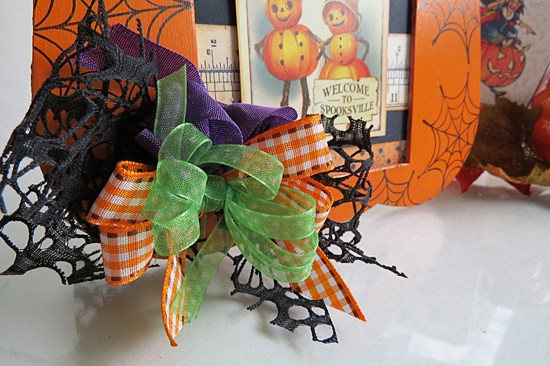 Most of the ribbons are from the September Ribbon club assortment but you can still get them online in the Halloween section of the ribbons here. It's always good to have lots of pretty ribbons on hand for things and since Thanksgiving is coming up too the oranges and other gorgeous colors will work great for that one. So many fun craft projects to make and so little time, right? Love what you did with the bow and the gorgeous colors and textures of the bow. The pumpkin picture is very cute and love the pumpkin frame to go with it. Will miss seeing your beautiful projects on Really Reasonable Ribbon blog and take care.